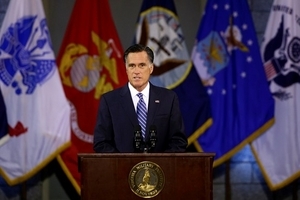 First, Romney’s policy ideas echo the rosy-tinted themes of George W. Bush’s failed policies in the region. Flush with optimism for Afghanistan, Iraq, and “Palestine,” Bush spoke a language that now seems from another world. For example, almost exactly nine years ago he predicted “a free Iraq [that] will be an example of freedom’s power throughout the Middle East.” I espy shades of this otherworldliness in Romney’s pronouncement that the Middle East hosts “a struggle between liberty and tyranny, justice and oppression, hope and despair,” his goal to build democratic institutions in Egypt, and his dream of “a democratic, prosperous Palestinian state living side by side in peace and security” with Israel. These are slogans, not serious policy.